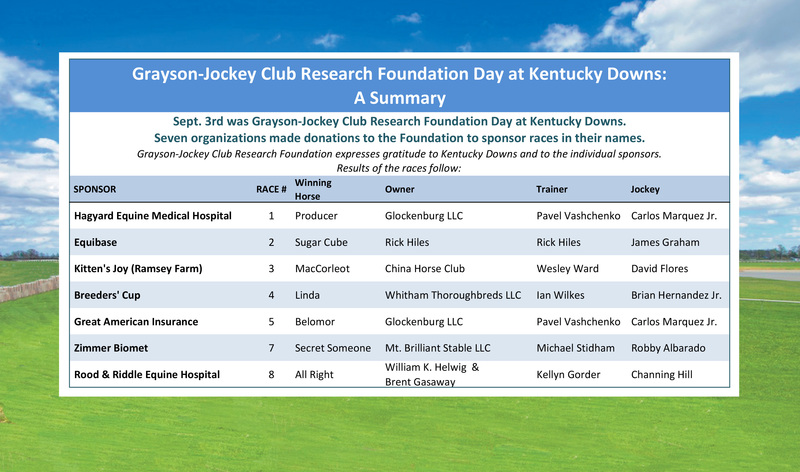 Sponsorships have been obtained for all of the seven races Kentucky Downs made available for Grayson-Jockey Club Research Foundation Day on Saturday, Sept. 3. The $350,000 Kentucky Downs Juvenile, presented by Rood & Riddle Equine Hospital, and the $350,000 Kentucky Downs Ladies Turf, presented by Zimmer Biomet, are among four stakes races on the Saturday card of European-style turf racing at the Franklin, Ky., course. "Again we thank Kentucky Downs for creating this opportunity to further our work," said Edward L. Bowen, president of Grayson-Jockey Club Research Foundation. "The quality of the racing will be exceptional. And we certainly appreciate all seven of our race sponsors for stepping up on behalf of the horse." Grayson-Jockey Club Research Foundation is traditionally the nation's leading source of private funding for equine medical research that benefits all breeds of horses. Since 1983, the foundation has provided more than $23.3 million to fund 335 projects at 42 universities in North America and overseas. Additional information about the foundation and is available at grayson-jockeyclub.org.